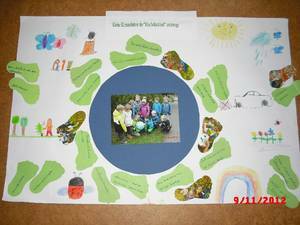 The children of the day care centre "Sachsenring" collected 174 Green Footprints and sent us many coloured cardboard feet with their ideas on climate protection. Thank you very much! 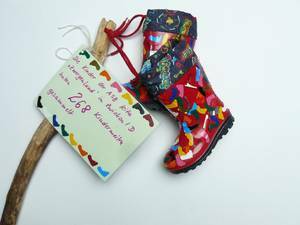 60 children from 3 groups of the day care centre "Schatzinsel" in Zwickau collected 800 Green Footprints from 17 September to 9 November. They had many thoughts on climate protection. That's why they made a big collage. These beautiful boots are made by the Kita Zwergenland - thank you very much for that! You can read in their report (pdf, 1,3 MB, German only), how they explored the school ways of children around the world.